Ales Loprais / Ferran Marco Alcayna / Petr Pokora took his second victory in the fourth stage of the Morocco Desert Challenge to Fezzou. 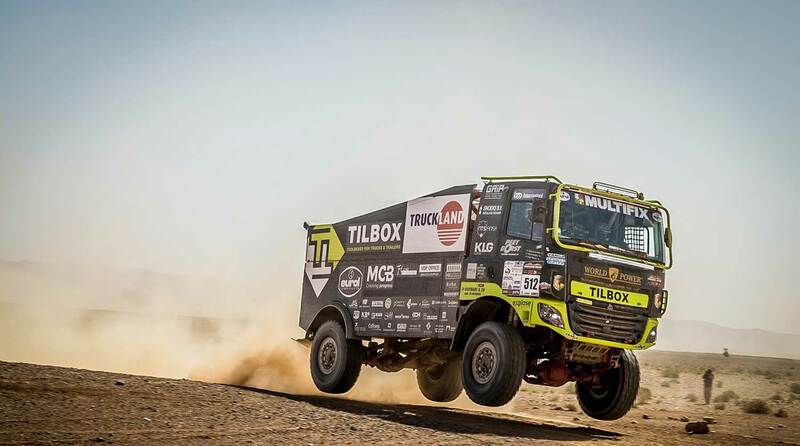 The Czech Tatra-team took another quarter of an hour to Martin van den Brink / Mitchel van den Brink / Wouter de Graaf (Renault, +15:45), who was stuck in the soft dunes of Erg Chegaga for a while, but still finished second. Third was the Iveco of Igor Bouwens / Dave Berghmans / Ulrich Boerboom with a gap of 16:12 minutes. A remarkable achievement came from Eimbert Timmermans (DAF), who finished fourth in the 310-kilometer long stage from Mhamid to Fezzou. Peter Versluis had to be transported by helicopter to the hospital in Ouarzazate. His teammate Roeland Voerman also called for medical help but eventually decided to continue. At this present moment, it is not yet clear what exactly happened. "It was a day for the navigators and mine (Ferran Alcayna) did a fine job," Ales Loprais said after the stage. "It was very difficult because there were many traces and not many points to validate. In a oued the GPS was open, but that gives you the tendency to choose the shortest route, indicated by the arrow, but the shortest route is not necessarily the best or the easiest." He continued: "We had to open the track in the dunes, which means that we had no reference points. It was hard work, because there were small and very soft dunes, so a lot of steering to do. Large dunes are easier than those smaller ones, even with our truck with nose. With a front nose, you see less, so you have to drive more on feeling and takes a lot of energy. A strip of 40 kilometres of lava rocks was a matter of survival and making sure keeping everything in one piece. We've got through well, without problems." Renault Pilot Martin van den Brink, driving together with his 16-year old son the first time, reported: "It was a long day, of more than five hours racing. We were stuck on the first dune, because the tire pressure was not good yet. That gave us the 15-minute loss of time on Loprais. Some moments later, we pulled Peter Versluis out, who was also stuck." "The navigation was complicated, but the road book was perfect according to Wouter (de Graaff). On the meter correct, with every stone in it. It was not a good day for the truck. It seems like the suspension is getting worse or the track is getting worse. There were so many difficult parts; so bumpy that everything breaks down. If I drive faster, the truck might fall apart." 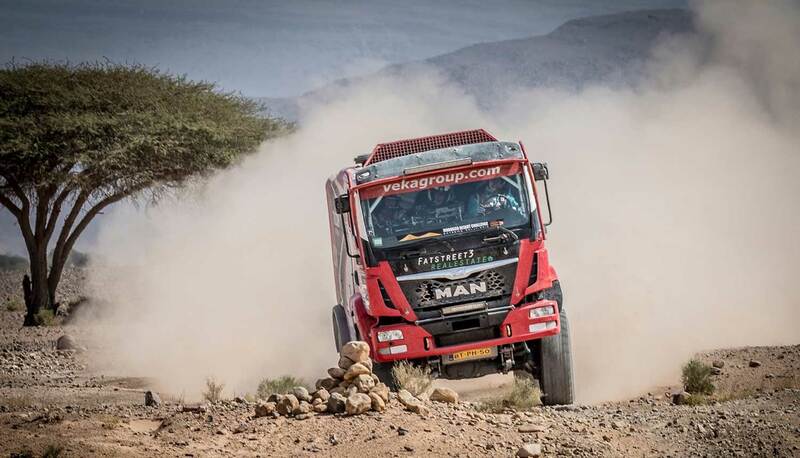 DAF-driver Eimbert Timmermans said: "If I can finish fourth with these contenders, with drivers who have won Dakar stages, it means that I have built a good truck. We left as sixteenth and were fourth at the finish. It went great. I like these kind of ‘dirty stages’, with a lot of dirt and bad pistes. In the five Dakar’s I did, I was the fast assistance truck, so I was always on the worst messed up tracks. I did some nice results there, but usually only once because the day I had to wait or stop to provide assistance. I don’t have to do that this time. I can now make my own race and apparently, that goes pretty well." 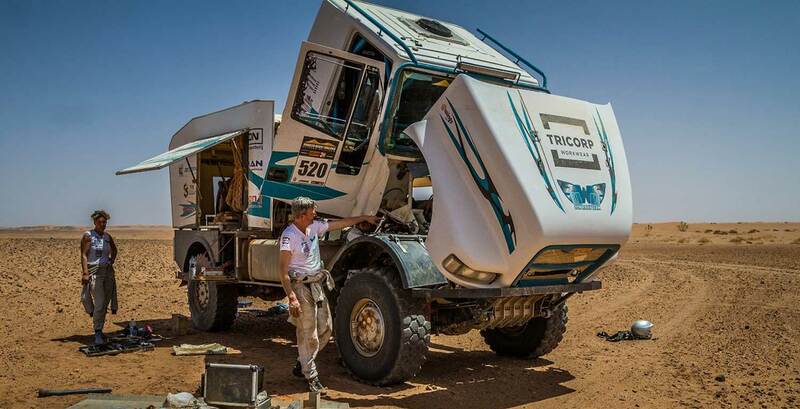 "My navigator (Geert Roothans) has never been to the desert before. In daily life he is dairy farmer in Portugal with 1600 cows. He is the best navigation farmer there is around. He really does a perfect job." "And the truck as well. It is such a nice vehicle to drive. This is the seventeenth truck I have built and I am here mainly to test and just to ride for fun. The classification does not interest me, although it is always nice to have a good result. Our teammate Paul Verheyden is currently third, so for him it is important. Meanwhile, he pulled us out this morning when we were stuck in the dunes. That was my fault."